ends 18-04-2019. Further information can refer the college official website https://josephscollege.ac.in/about-st-josephs/administration/ for St.Joseph's Degree and PG College Lecturers Vacancies. Interested Applicants can Post your application to college address or college Email-id Address to given below. Required Details like Salary, Important dates, selection Process, Qualification are given below. Starting date to apply for St.Joseph's Degree and PG College Lecturer Jobs: 05-04-2019. 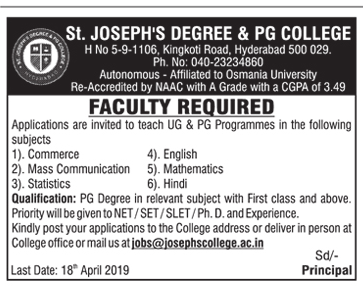 Ending date to apply for St.Joseph's Degree and PG College Lecturer Jobs: 18-04-2019. For Lecturer Post Required First class PG in concerned department. Ph.D / SET / NET / SLET . Interested candidates can Post your application to college address or college Email-id Address to given below. Last Date to apply is 18-04-2019.